RobotMonkey is taking care of developing the Plotic forward right now. Aight, let's make an own thread for Plotic. 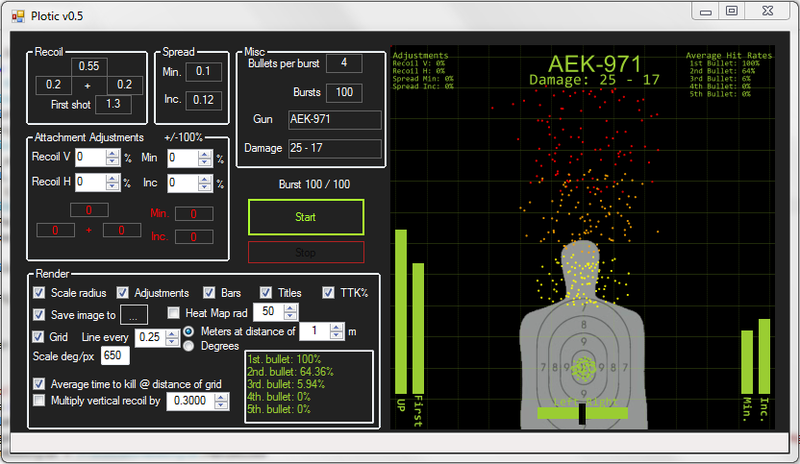 As you may already know, it's the program that I made for drawing the accuracy plots. I'm going to take it to the next level now. 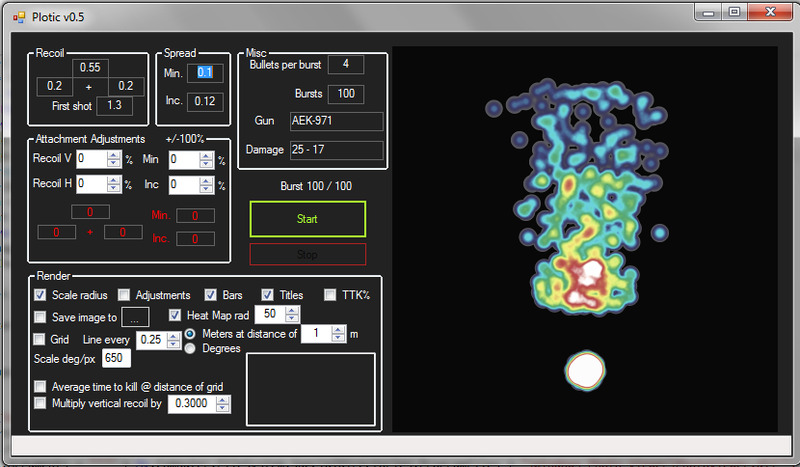 - Adding an algorithm to calculate average hit rate, time to kill and so on for targets at specific distance. - Make the program decrypt the data directly from BF3's files so it's always up to date. So far it doesn't have too many confusing options, just the ones needed. The 'Scale radius' might be only one that's unclear. It means that the length of radius for random point in circle is scaled with square root so dots are evenly distributed in the circle. Without scaling the dots will more likely go to center than to the sides. Mul being high value number since the way randoms are generated only returns integers. You sir, are quite the overachiever! The randoms are generated way faster now so drawing the plot won't take long anymore. Also added option to draw grid in degrees or meters at some specific range. I've re-written it to be threaded, allowing you to stop the graphing process at any point. I also added spinners for attachment adjustment percentages. I will be adding your adjustments as well once I go through the code. I was wondering if you would be interested in allowing me to add this to a GitHub repo. It would allow for others to help improve on the program while allowing you to continue to make improvements as well. If you are interested in the code as it is to see how the threading is being worked out, let me know and I can use pastebin or something along those lines. Hay just wondering I may be asking at the wrong place but I'm looking for the sourcecode from the plotic project. Bottom of the first post. I'll be busy ~4-5 weeks from now with girlfriend & holidays and have zero time for Plotic. Who ever wants to improve and develop it forward, go ahead. I'll upload the full source of 0.6 tomorrow. Edit: Nvm, RobotMonkey has the sources below with some nice changes. Odd question but are all the class models the same size in terms of hit detection? I.e if I was a Recon would I be less of a target than a bulky Engineer in the same position? Obviously they all look different but I wondered if they were all the same model just reskinned for appearance? Also makes me wonder if the hit box includes your weapon? (No Pun). So again could an Engineer be shot in the Javellin he carries (which are quite sizeable). Probably not worth plotting but curious in any case. From my experience, everyone is pretty much the same size. Changing the hitbox for each class wouldn't be very productive. That is the main reason I changed to a standard human outline for mine. In game, I highly doubt the models are the same, but they wouldn't have the variance too big.